The strange story of my uncle, George Meston, who died in October 1998, aged 91. George was a highly respected member of his community, in Melrose, Roxburghshire, Scotland, where he had spent most of his life. 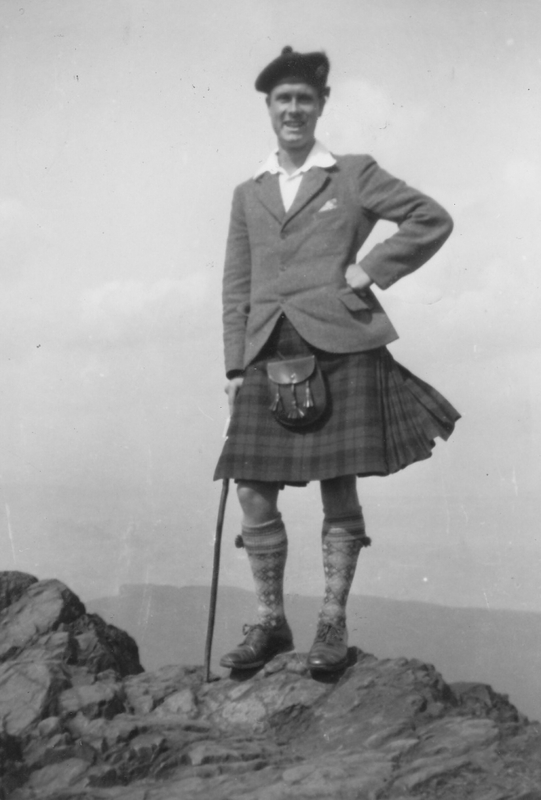 Professionally he had been the Head Geography teacher in Hawick Academy for many years, and was known as a charismatic teacher who enthused his pupils with a pioneering spirit of adventure. Probably his most illustrious pupil was Chay Blythe, who in 1971 embarked on his own adventure of sailing solo round the world. For many other, less famous, pupils, “Mr Meston” was a kind of "Indiana Jones" character, who seemed to have boundless energy for travel, and a “magpie” obsession for amassing information about world affairs. He took many pupils on their first trips abroad, and made sure that they were prepared in every possible way to take advantage of the experience - geographically, historically and socio-politically. He was also an authority on various other subjects, including the remote Scottish Island of St Kilda, about which he had lectured, and to which he had travelled several times, on one occasion being the only person camping on the islands. In his early years he had embarked on a journey through the Scottish islands, which involved him swimming between several islands, including Mull and Iona, where more recently four men were drowned crossing the same stretch of water in a boat. Certainly, I and my brother, who were his closest relatives, regarded him as an adventurer, and in our childhood he always seemed to be coming back from some exotic place with fascinating stories. Ironically enough when I went into his house for the first time after he died, spread out on the sitting room floor were countless newspaper articles ( which was his habit ) including one about the lost ark, with a picture of Indiana Jones. The irony would have been totally lost on him, as I’m sure he had never heard of Indiana Jones, and certainly never knew that that was how he appeared to me. Another interest of his was statistics, and he had an elephant’s memory for facts concerning political and governmental issues, particularly in the area of international relations, trade and defence. All in all, he had a remarkable brain, and one felt more or less totally unable to have, let alone ever win, an argument with him. I use the word argument deliberately, as it was rare that a conversation with him was ever a discussion. This of course could alienate many people, but given that those same people also recognised that he had a formidable battery of information at this fingertips, and that he was fiercely “principled”, he was regarded as a pillar of uprightness, if, at the same time a formidable opponent. In reality he was an isolated man who found himself at odds with most of the world around him. His political views veered to the extreme right; at one and the same time he was an ally of Thatcherism, and a critic of material aggrandisement, a promoter of brotherly love across racial divides, yet a critic of inherent weaknesses (as he saw them) in certain races. Above all he was a fierce critic of moral degeneration, and laxity in our society, seeing the vast majority of people as without any “moral fibre”. To superficial friends and neighbours, however, he was a hearty chap with a willingness to help where possible. All of this, however, concealed a private obsession, the full extent of which only emerged after his death. In our small family ( he was my mother’s brother), my uncle was a problematic character. He had, from his early years, dabbled in different causes and beliefs. Having been brought up in a rather severely Presbyterian family background, he soon began to espouse other “causes”, including Jehovah’s Witnesses, Vegetarianism, and a “Fitness League” which treated even that as some kind of religion. He then moved on to Moral Re-Armament, with which he was involved for many years, and rekindled his allegiance to the Scottish Presbyterian church. He threw himself into these causes with total commitment, but these changes of affection caused many problems initially in his own family, whom he tried to encourage to follow him, and later made it extremely difficult for him to find a partner who could follow his vacillations. He left behind a large collection of letters and journals which catalogue his disastrous love-affairs. He meticulously kept copies of the tortured letters he wrote to the hapless girls, which endlessly compared their good qualities and bad, and discussed whether they were “noble” enough in mind, or domestic enough to share their life with him. The letters often tried to make a thinly disguised plea for pity on this poor wretched specimen of humanity, and the journals are full of self-castigation about his “impurity”, and desperate prayers for solutions to his problems. There are conversations with God, which are an extraordinary mixture of gratitude and reproach, fulsome gratitude next to abject depression and self loathing, and philosophical essays on a huge number of existential subjects. Reading these documents, the impression they leave is of deep unhappiness, and a searching for love and approval which he had felt denied all his life. In the early seventies he seemed to have transferred his interest again to something that he kept rather quiet from the family. He was never available on Saturdays for any social engagements, would never answer the phone on Friday evenings or Saturdays, and started making it known that he would not celebrate Christmas, and wanted neither Christmas cards nor presents. Any such would be sent back. My parents didn’t involve themselves in questioning too much about this, but to some extent our social contact dropped off as a result of his secrecy. All the while however, until well into his sixties, when he was still a bachelor, my mother dealt with his laundry every week, and used to undertake other tasks for him, such as providing food, or helping with home decorating, spring cleaning, and so on. All this would have been of no import but for the fact that he took it on himself to be a kind of moral guardian of our family, never holding back on giving his advice as to how my parents should be bringing us up, and how they should be directing our general and spiritual education. Relations were sometimes very strained, particularly between my father and George, and it was only after he died that I found some letters in which many years before he had offered some devastating advice to my mother - vis - “As your husband-to-be has not committed himself to God, your marriage will be sinful.” As I also discovered, this threw my mother into confusion, as she respected her older brother for his brilliance, but was totally confused by his “moral” principals into thinking she was sinful. Over the years my parents tried to forget this painful period in their lives, but I was aware that it had in some way affected our family quite badly. There was an enormous tussle in my mother’s conscience between family loyalty and the hurt which George had caused her. At the same time, because of his rather solitary life, George was very grateful for the interaction he had as our Uncle within our family. In the seventies George suddenly announced that he was marrying - he was in his late sixties and his wife-to-be in her fifties. They were married in a civil ceremony undertaken by their “church”, which, it transpired, was the “Worldwide Church of God”. The marriage ceremony included a rather severe lecture ( by a lay-preacher) to both participants about their roles within the union, but the thing that particularly struck me was the way in which the poor wife was subjected to a list of do’s and dont’s which left her in no doubt that her role was a subservient one to her husband, leaving her little room for manoeuvre. And he was told that he should not give in to her whims, if they included requests for things that might be thought of as “frippery” or superfluous, such as a hat or make-up. I took a dim view of the proceedings, though kept my feelings private, as I was glad that somehow these two lonely people ( she was a childless widow) had found each other, and that remarkably they were both of the same “persuasion”. The obvious didn’t dawn on me until much later; that they had been “put together” by the church. Time passed, and relations between my parents and George and his wife improved. Though Jenifer, George’s wife, did indeed seem to have little scope for her own personality ( whatever that was), she did seem to have a generally civilising influence on him, and from a practical point of view, she was the best maid and servant that he could ever have hoped to have had. As a painfully shy person, she didn’t seem to question her role, as she obviously admired him and let him have total control over all that they did, including, for example, letting her have a monthly sum of money for food, and challenging her to work within that budget, with the promise that she could save for herself whatever she managed to have left over. We maintained a diplomatic silence over the religious activities - in any case it was a private matter, and entirely their business. It only caused problems when for one reason or another they would excuse themselves from events, in which my mother had hoped they might take part. Some time around 1990 we understood that, in the “church” department, there was another change of allegiance, but to what we were never informed. What had become more obvious, however was that the “Sabbath” period - Friday sunset to Saturday sunset - had become ever more sacrosanct. No social contact was maintained between those times. Some time in the early nineties my mother cautiously told me that a great misfortune had befallen my uncle George. Apparently he had lost a great deal of money in a South African gold mine investment. He didn’t really want the family to know (according to my mother), partly because, having always prided himself on his acumen in field of investment, and never reticent in telling other people where they should be investing their money, his pride had been dealt a severe blow. There was. however, never any visible sign of him being impoverished, nor did the loss seem to have any effect on his lifestyle, which was reasonably comfortable. But at the time of my own mother’s death in 1996, she felt concerned enough about her brother to leave him £10000, without actually knowing specific details of his “loss”. Not long after that, George’s own wife Jenifer died. The circumstances of her death led me to believe that either George was seriously unhinged, or some completely alien manner of thinking had taken him over. But he was, to all intents and purposes, in sound mind and not affected by dementia. Jenifer collapsed unexpectedly while shopping one Friday in November 1996. When I spoke to George on the phone on the Saturday evening, he told me that, although she was obviously not well, he would delay telling the doctor until the following Tuesday, when he himself had a doctor’s appointment. I urged him to call the doctor immediately. By the Tuesday he had still not contacted the doctor. In the afternoon, as planned, he left the house to go to his appointment. He had left Jenifer lying on the sitting room floor wrapped up in a duvet close to a coal fire for warmth(as the house was not centrally heated), and, as he himself said, he could not understand why her arms and legs were so cold. Having had his check-up he told the doctor, who from the description given said he would come round the next morning. By the time the doctor did come, Jenifer was dead, having had a series of heart attacks, the first of which had been on the previous Friday. Following this sad event I endeavoured to help my uncle as much as possible from my home in London, and as I was already making frequent trips to Scotland to visit my own widowed 92 year old father, I used to tie in visits to my uncle at the same time. In time he asked me to assume the role of Attorney (and at the same time appointed me an executor of his will) for him, in case of an emergency. It had transpired that, although the doctor had said that he was in incredibly good health for a man of his age - 90 at the time - this was either a soothing reassurance, or actually a mistake, because he had had symptoms of dizziness for quite some time which were signs of a major problem with his aorta. This was likely to kill him or, at least, cause him a major stroke at any time. He was open about this with me, hence his need for me to have POA for him. By September 1998 he had been hospitalised several times, and surprised me by announcing that he had been planning a trip to the Holy Land, which he was very anxious to undertake in spite of his health. The doctors had been non-committal about the possibility of him going, since the seriousness of his condition was known to everyone by this time. Knowing that this was very important to him, I did everything possible to encourage him to go, helping him in various ways with his bookings, currency, passport etc. He was discharged - at his behest - from hospital only a matter of days before the trip was due to begin. At the same time I was concerned because, although it was by now about a year since he had asked me to be his Attorney, I had never signed any documents, without which I knew I could not exercise the power. To my entreaties he replied “Don’t worry, it probably wont be necessary” , and “It will all be sorted out when I die”, somehow conveniently forgetting the reasons for which he had asked me to be his Attorney in the first place. I, however, painted the worse-case scenario of him having a stroke in Israel, which would mean I would have to go to collect him(or his body). Finally he released the name of his solicitor, whom I rang to express my concerns about not having signed the document before my uncle went on this long journey. He had some years before visited various holy sites in Israel, and was extremely keen to visit them again. What the solicitor told me surprised me. It transpired that my uncle had asked him to prepare the document, but not to present it to the court. Effectively that meant that I had no access to his financial affairs. The solicitor parried by saying that if an emergency did happen it wouldn’t take too long to process the papers - not my experience of legal processes! ( and certainly not much help if I had had to drop everything to go at a moment’s notice to Israel or to deal with private hospitalisation abroad etc.). All of this fell into place after my uncle died, which happened barely a week after he returned. He had survived the trip, but, seriously weakened, he was transferred to hospital immediately his plane got back to Edinburgh. His death, though sad, was not a shock. I had felt that, though he had never said so, he would have liked to die in Israel. The place had such a “pull” on him because of his beliefs, that the trip was being undertaken as some kind of atonement. The surprise, however, when he died, was that he had given over his entire estate ( including of course the money my mother had left him) to The Philadelphia Church of God, the organisation run by Gerald Flurry, of which he had been a member for several years. In addition to that, in the year before his death he had given something in the region of £40000 to the “cult”, had been tithing money to the group for years, and had given his wife’s estate to them after her death. This I saw with my own eyes, from documents which he had obviously not wanted me to see while he was still alive - hence the farago over the POA. Effectively I was barred from removing anything other than papers for the solicitor from the house, as the house and contents were also left to the cult, with £25000 to be paid immediately from his estate, and the remainder on completion of his estate, sale of the house, realisation of investments etc. When I entered the house it was therefore a strange feeling to see a large picture of myself, and another of my parents, taking pride of place on the mantelpiece, yet knowing that my task was to hand over everything which was connected with our family to the cult. The other two Executors were a Mr and Mrs Brown, who were latterly my uncle’s only real friends (and who were also members of the PCG), and Billie Brown informed me that his task - given by George -was to remove any religious documents from the house and send them back to the PCG “as soon as possible”. I had access to the house first and was able to take a look at the material in the house. What I found was to my mind, quite astonishing. There were about three tea chests-full of religious tracts which my uncle had written, some of them fifty or sixty pages long. Many of these tracts were concerned with dating systems of the old Testament, cataloguing old Testament kings, dates of events, prophesies etc. Many of them made analogies between old Testament prophesies or disasters and catastrophies in modern times, such as Chernobyl, claiming that the exact dates of these modern day times were prophesied in various old testament references. It became clear from what I saw that the PCG is an “end-of-time” cult which predicts that Armageddon is coming very soon. On a slip of paper in my uncle’s writing I also found an exact day and month for Christ’s return in 2002. In addition to these documents, there were dozens, if not hundreds, of tapes from Gerald Flurry, “sermons” for every week, preaching hellfire and brimstone, unless sins were atoned for, reparations made for past indiscretions etc. My uncle’s study was packed with learned tomes on biblical studies, pages and pages of calculations connected with all manner of ancient dating systems, and all the evidence of his financial dealings with the PCG. There were also copies of letters asking for advice in how decisions should be made in relation to the “orders” of the church. One in particular caught my eye. I am a professional cellist, and had an important solo engagement with the Scottish National Orchestra which took place on a Friday evening. My Uncle had written a letter to the PCG asking if he would be condemned if he “broke” the Sabbath to attend this concert. He did not come. I gradually built up a picture of the way in which the PCG had controlled everything in his life, from the people he should associate with, to his expectation of salvation depending on the amount of money he was prepared to give them. But while I was uncovering all this evidence, I felt a sense of confusion as to whether I was imputing an interpretation on the material I was looking at. (I also had some loyalty to the side of my uncle that I knew and loved). But as I looked into all the piles of documents my instinct and conviction about what I was seeing gradually deepened. I found evidence(in the form of letters ) from people who had been “dis-fellowshipped”, trying to warn my uncle that something was very wrong about this group. But I suspect they had come too late for him to accept that they might be right, and in any case he wasn’t supposed to communicate with these people, as they were regarded as “in league with the devil”. There was one sad letter from a lady who told him that she had been kicked out because she had sought therapy. All in all, it was a chilling picture, to discover the way in which this intelligent man had fallen under the thrall of this belligerant “totalitarian” regime, handing out instructions to its members as to how they could or could not behave, in such a way as to deny their own volition. If guilt had eventually impinged on his conscience in his handling of his wife’s last days, it was therefore obvious that to atone he had to hand over her estate to the PCG. (Technically he could not ring the doctor on a Friday or Saturday, which should have absolved him of some guilt, but he could hardly blame the church for his continuing oversight after that.) A matter of weeks before he died, he told me that he had made many mistakes in his life, which I later understood had to be paid for, or eternal damnation was the reward. I sent one or two of the religious tracts my uncle had written to a Professor of Divinity at Glasgow University, as I was really curious to know whether or not all the work that he had put into this was of any intrinsic value. The sad reply was that, in spite of painstaking research, the whole thing was based on biased reading of the texts, using false information disseminated by Gerald Flurry and the PCG (though originally this had come from the Worldwide Church’s “prophet”, Herbert Armstrong). Basically, followers are kept busy with unfathomable religious tenets, based on spurious “knowledge” and interpretation of the old testament prophets. These are then used to disseminate fear concerning past sinful actions, and to create suspicion of any views held outside the “church’s” teaching. I would not bother to tell you all this, but for the fact that I know that my uncle was of more than average intelligence, and to understand the fact that he was so duped, is quite hard for me. It is also chilling to realise that if he was so easily “led” then, for sure, other people are too. The “squeaky clean” image of “normality”, family life and piety which the church presents, is a front to a corrupt money-making organisation which has really no true spiritual basis. What is interesting is that since I have become aware of the existence of the PCG, it has come to my notice that there are several sites on the Internet devoted to exposing the corrupt practices of the church. Many of the stories on the Internet sites confirm my own experience. The point of my uncle’s Israel trip was to join a group of the PCG who were visiting sites of religious importance. The Israel trip was a death-wish for my uncle. He didn’t quite succeed. The followers were daily hooked up by satellite link to Gerald Flurry in the States. One of the rather pathetic last entries in my uncle’s diary recorded “No new revelation from Gerald Flurry”. One of the last things that he was reading was Herbert Armstrong’s “1975 in Prophecy” prediction of terrible ravages that were to overcome those who were not “saved”. This was illustrated with boys’-magazine-types of ghoulish cartoon illustrations. My uncle recorded the exact date and time of his last reading of this document - he had read it several times before, and as early as 1968, according to his annotations. There are many more things I could tell you in this, for me, strange tale. As my uncle used to be at pains to tell me how much he loved me, it was all very hurtful, especially the element of deception in which he involved me. Some people might say that my involvement in all of this is only because I feel aggrieved that he did not leave money to myself and my brother ( as he had done in a previous will. The last one - to the PCG - having been made only five months before his death), but that is not of such import to me. I would much rather that he had left his estate to a bona-fide charity which would actually have done some good. I arranged the funeral, but was not prepared to attend a ceremony which was conducted by the British leader of the group, John Durrad ( the British arm of the church is registered as a charity, with Mr Durrad and Mr Flurry having been two of its three Trustees). I made my own peace with my uncle, regretting that he had fallen into the hands of such a manipulative organisation. It is a curious irony that, for a man who professed such fiercely held views on morality, decency, and above all, honesty, he should have fallen into the clutches of such a bogus organisation, thinking at the same time that he was saving the world. The reasons why people give to charities are obviously many and varied, and sometimes not neccessarily logical, and to some extent all charity calls on an emotional response to trigger action. But the waters are muddied when the individual's emotional response is compromised by undue pressure to encourage their donation. I do wonder just how many other people have found themselves trapped into paying for their salvation through the “teachings” of the Philadelphia Church.